Over the past few weeks, some EVE Online players with a penchant for research and discovery have stumbled onto what appears to be a new story thread hidden in the game—perhaps a little bit before the game’s publisher wanted them to. Unlike many other contemporary MMORPGs whose stories are presented through obvious quests highlighted in the UI, the storylines of EVE are often deeply hidden and left for players to find and experience for themselves. Most recently, a highly dedicated group of lore-minded players have been harvesting and compiling what appear to be encrypted video files from NPC ships inside the game. The video files, once encrypted, seem to hold the secrets to recent events in EVE. The players, who belong to a group called the Arataka Research Consortium (ARC), have been seeking to uncover the secrets of the mysterious “Drifter” NPC faction since they were first added to the game several years ago. In the latest iteration of the Drifter storyline, players have seen the NPCs swarming through the game’s high-security region in greater numbers than ever before. Once players pushed past the initial fear of seeing 25 to 75 of the terrifyingly powerful NPC ships in once place, they began to take note that the entire Drifter fleet showed a great deal of battle damage, meaning that they could potentially be easier to take down. 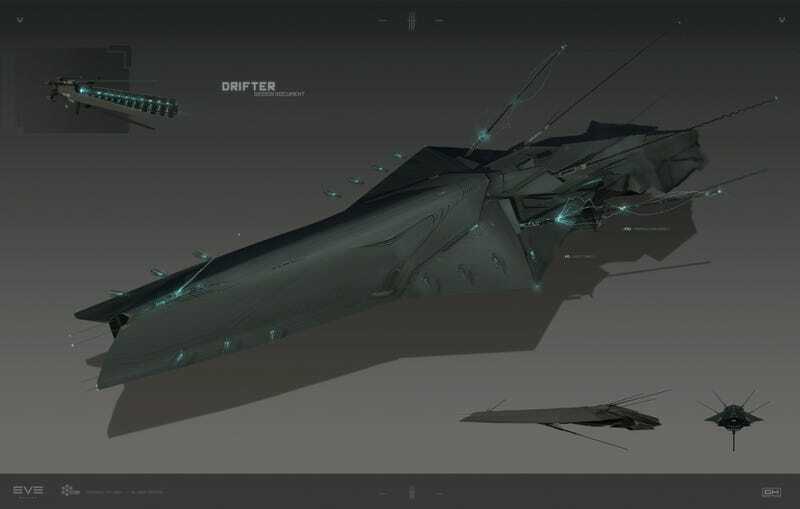 ARC players began to form fleets to fight these weakened and damaged groups of Drifters, and eventually a new type of item dropped from one of the destroyed ships. These items, called Trinary Data Vaults, contained links to a video hosted on publisher CCP’swebsite. Unfortunately, the videos appeared to be complete and total gibberish. After this, efforts to hunt down the Drifter fleets were redoubled and bounties for the information collected from the Data Vaults were issued. As more and more data vaults came into possession of the ARC group, they compiled the data contained within and a video began to take shape. The video shows blurry scene of a Drifter fleet under attack from a brand new type of ship that has never been seen in the game before. After decrypting the video, the Arataka Research Consortium released a special edition of their lore vlog, The Discourse. The Discourse is a fan project that features the players voice-acting the characters they represent in the game. It is presented as an in-universe news report that attempts to explain the current events in the EVE storyline. These videos serve to enlighten those who are interested in the game’s ongoing story, but may not have the means to engage in the associated gameplay. While the members of the Arataka Consortium searched the EVE universe in search of more Drifter ships to harvest information from, players on the EVE subreddit turned to other sources. The bane of new story elements in many MMORPGs is the data mining websites dedicated to those sites, and EVE is no stranger to them: A fan-run website called hoboleaks scans the EVE test server after every patch, comparing it to the live server, and presenting the differences to its visitors. Near the time that the Drifter swarms carrying the Trinary Data Vaults began to appear, hoboleaks was updated with several new ships hidden in the game files. In addition to models of the new vessels, there was also a name for them: Triglavian. EVE player Uriel Anteovnuecci, a member of the Arataka Consortium, posted a video of the ships to YouTube. Immediately, similarities between the new vessels and the footage recovered from the Drifter wrecks were noticed. The central core of the Triglavian vessels is easily seen in the footage of the Drifter ships being attacked, and can be seen flitting around the battlefield, harassing the Drifter fleet in the footage. Between the footage recovered from the data vaults, and the game files updated to the test server, the Consortium seemingly has their answers: Yes, the Drifter fleets are indeed being attacked by what seem to be brand-new entities within the EVE Online game world. The timing of these storyline elements emerging in the game world is very likely not coincidental. In just over a week, EVE Online will be celebrating its 15th anniversary by playing host to thousands of players from all over the world at the annual EVE Fanfest celebration in Reykjavik, Iceland. Fanfest, a massive party celebrating all facets of EVE Online, is usually the occasion of major announcements regarding the future of EVE. As the event draws near, the mystery surrounding the Drifters and the new Triglaivan ships is rapidly unravelling. Over the weekend leading up to Fanfest, a damaged Triglaivan vessel was located by EVE players. The mysterious ship was seen floating in the home system of EVE’s in-universe police force CONCORD. The vessel is shown to be piloted by an NPC actor who has been featured in the storyline as a member of the security force. Players from all parts of the galaxy have traveled to the system to watch and wait for further updates. This storyline will seemingly be opened up during the Fanfest celebration, since the schedule lists a panel called “The Triglaivan Domain.” This panel should be the first official announcements about just who or what these mysterious new vessels are, and will represent the culmination of several months of emergent storytelling inside the game world. And as with many events in the world of EVE, its discovery has been primarily driven by the players themselves.